As a weaver, Jonas Stundzia creates tablecloths, table runners, scarves, sashes, and items for religious celebrations, such as table coverings for Easter. Much of his knowledge of techniques, patterns, and color schemes came from his family and the Lithuanian community in Lawrence, where he was born and raised, and through strong ties to his family heritage in the old country, which he visits regularly. 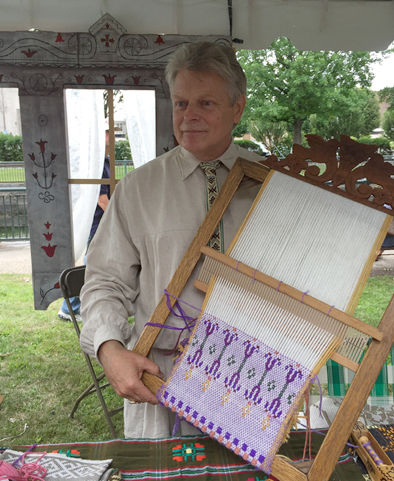 Jonas will demonstrate a style of Lithuanian weaving called kaisytinis,a hand method of thread lifting where patterns and colors are incorporated into the weave. This detail work requires lifting each individual thread using the head of a fine tool. "That's where the art is," Jonas says. "That's where the tradition comes." The work is done on a simple frame loom, which evolved from an ancient harness loom, a portable loom used by shepherds while tending their flocks. What once was woven by every household has been replaced by machine-made textiles, yet mechanization has not eradicated the tradition. Instead, it has stimulated Lithuanians both here and in Lithuania to maintain weaving guilds and folk art institutions to help preserve this ancient craft. Even during the period of Soviet Internationalism, which sought to eradicate local folk culture, Lithuanian folk patterns and traditions survived, keeping national identity alive.